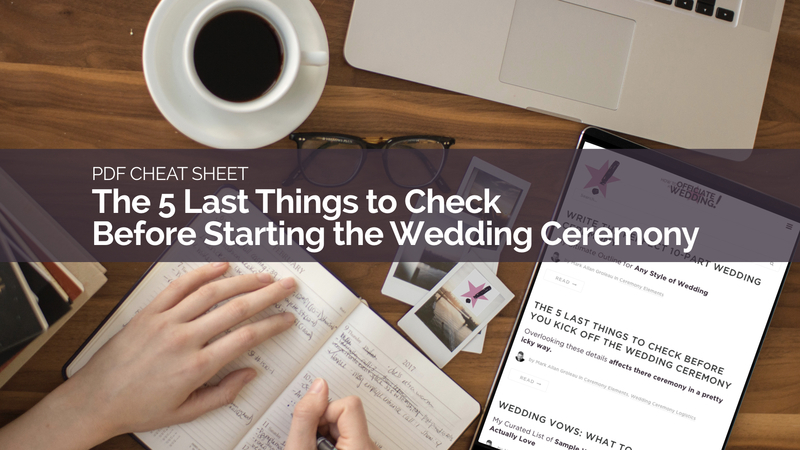 As the wedding officiant, you need to check five last details before you walk down the aisle and kick off the ceremony. The moment you walk out and take the front, the train has left the station. The horse has left the barn. The ball is in play. [Insert other metaphor here.] In a nutshell, there’s just no going back. Now, there will always be things we can’t foresee and control, but there are some things we can. And sure, there are lots of details to take care of when you arrive at the ceremony venue. But in the two minutes before you walk out there, focus on these five. Why these five? Because, as you’ll see, if they’re overlooked or not as they should be, it affects the ceremony in a pretty icky way. That’s no metaphor. Literally, make sure the pages of your ceremony manuscript are in the proper chronological order. I’m still scarred from one of my earliest officiating gigs. It was go time, and I was leading the groom and his groomsmen towards the entrance to the hall where 150 guests were sitting and waiting. Suddenly, I got this overwhelming sense that I needed to give my binder a last look-over. “Wait – stop.” I said. Then I started flipping through the pages. Sure enough, they were jumbled in a couple of places. I broke out in a cold sweat and wanted to hug myself for listening to that intuitive voice. You can imagine how gnarly things would have gotten if I’d started the ceremony and made that grisly little discovery in the middle of the action. Pro-tip: Always make sure your printed pages have clear page numbers. I’ve never made that mistake again. I always, always check the page numbers – 1, 2, 3, 4, 5… – before I get the ceremony underway. Then, about two minutes before ceremony start time – just as the couple and their wedding party are marshalling at the back for their entrance – I take a last casual walk to the front. And I check on these next two things. If the ceremony is a legalization where you’re signing a civil marriage license during the proceedings, you’ll want to make sure the paperwork is either on the signing table or in your binder (mine’s large enough so it fits comfortably). It’ll get weird if you get to that part of the ceremony and it’s in your car. And equally importantly: make sure you have a pen. Either it’s on the table or in your pocket (Risky, though! A growing splotch of ink on your chest during the ceremony will make things awkward). You don’t want to be surveying the guests for something to sign with in the ceremony. Pro-tip: sometimes the couple might forget to bring their marriage license. No worries! In that case, we just do a “fake” signing with any piece of paper and pose for the photos. It just means we get to meet up again a few days later and sign over a drink! Alright, after I’ve checked that the paperwork and pen are ready, I turn around and make sure of the third thing. It’s common for the first few rows to be designated “reserved” by default. And then here’s what happens: those seats are so sacred that no one is actually invited to sit in them. Then the ceremony starts, and there’s a gulf of empty seats between the couple and their guests. Not great. Especially for the photos. Not to mention the energy and intimacy of the occasion. A proactive measure is be to make sure the ushers and/or groomsmen know exactly who is supposed to be sitting in those seats. Pro-tip: Make sure whoever are seating the guests know exactly who the reserved seats are for. But if you’re about to start and you notice the front rows are empty, don’t begin. Ask the planner or venue staff or a couple of ushers or groomsmen to get to work discreetly asking certain guests one-by-one to fill in the front rows. There. That’s better. Now, let’s get back to the wedding party and check on those last two things before we start. Everyone is lined up at the back in the correct order just as you rehearsed. Terrific. Now let’s prevent this old cliche wedding ceremony faux-pas: “Uh… where are they? I was sure I had the rings in my pocket.” It’s a real downer to the proceedings. In traditional ceremonies, the rings are held by one person like the Best Man. Or they’re carried to the front by a ring bearer. With that taken care of, it’s time to ask one final question. Whenever I see that little plot device in the movies, I get distracted from the intended drama of the screenwriter (probably in the same way real lawyers can’t watch courtroom dramas). Because a runaway bride means that the officiant didn’t do his or her job well. I care too much about the couple to leave it to blind hope that the bride or groom scheduled to make an entrance will actually show up when the music starts. Not just “Are you ready?” I want them to really consider what is about to happen. Now, you don’t have to be serious as a judge or anything; I usually say it with a smile and then a little pep talk. But I make sure to phrase the question in a way that hits home: essentially, you’re about to get married to this person. Are you sure you wanna do that? It’s extremely unlikely that a bride or groom will bail after answering “yes” to the question directly. No runaways on our watch if we can help it, right? The wedding officiant can go a long way to calming the jitters. And the couple and their party remember how you helped them feel long after the ceremony ends. There you have it. With those five things settled and not a doubt in your mind, you can walk up there with total confidence and master that ceremony. 'Wanna take this away as a cheat sheet? I try to go up to the front and make sure everything is in place, nothing is off center or hanging off the arch and that there is enough room for everyone. I also check outside ceremonies to see where the sun is to see if I need sunglasses or just to know what to expect when I am up there. Outdoor ceremonies, I always check the wedding tribe’s path to make sure there are no tree roots or debris that can cause someone to trip or catch their clothing on and that there is a clear path to the front.